This wasn’t the first time Evangelical leaders participated in the largest annual gathering of Muslims in the United States. The Islamic Society of North America Annual Convention has for many years included panel sessions, discussions and even celebratory events on interfaith relations with religiously diverse leaders. Perhaps because of the unique relationship between the current U.S. presidential administration and Evangelical leaders, and because of a heightened political climate of partisan and ideological divides, this was the first ISNA convention to feature multiple conversations about bridging these divides and a majority Evangelical panel, live recorded for a predominantly Christian podcast audience. Neighborly Faith is an organization that seeks to help Evangelicals become better neighbors to people of other faiths. On September 6, 2018 Neighborly Faith partnered with America Indivisible, a national organization that addresses anti-Muslim bigotry by strengthening neighborly ties, to make the case for better Muslim-Evangelical relations directly to Muslims in Houston and Evangelical podcast listeners all over the country. The panel, titled “Reaching Persuadable Americans: Why Engaging Conservatives Matters,” featured Neighborly Faith co-hosts Kevin Singer and Chris Stackaruk, Texas megachurch Pastor Bob Roberts Jr., president of Islamic Relief USA Anwar Khan, and Dalia Mogahed, director of research at the Institute for Social Policy and Understanding. What was especially intriguing were the questions and comments during the Q&A. They provide a window into what everyday Muslim Americans are concerned about when it comes to their relationships with Evangelicals and conservatives. As we shuffled through the question cards, we noticed a couple of themes emerge. Still, audience members seemed genuinely curious about the prospect of improved relations with Evangelical Trump supporters. “What is the role (is there a role) in trying to engage Trump supporters?” one audience member asked. Another attendee even expressed sympathy for conservatives who are worried about their faith being mocked and removed from the public square, asking, “Can the shared experience of marginality be a basis for positive relationship?” This question is not necessarily a new one. Muslim thinkers have pondered over the ways that Evangelicals of the past paved the way for the Muslims of today to insert religion into public conversation and politics. Unsurprisingly, some of the questions and comments we received indicated a perceived contradiction between Evangelical faith commitments and Evangelical behaviors. One recalled a pastor in Florida who burns Qurans, perplexed that someone taught by their religion to love would do something so hateful. Another asked, “How do we reach those who identify as Evangelicals but do not practice what they preach?” One attendee admitted confusion over why someone claiming to be an expert in his religion, pastor or imam, would cite fear of being converted as a reason for withholding friendship. Though some audience members wrestled with their doubts and negative experiences, others expressed an eagerness to take steps toward Evangelicals and asked the panelists to give them practical tips for getting started. “Please tell us steps for ‘ordinary’ as in, not well-informed in religion, Muslims to approach conservatives and non-Muslims,” one card read. “What can Muslims (individuals, communities, etc.) do to stand up against hate?” and “How do we motivate Muslims to take the first step?” were also posed to the panel. These themes, when taken together, suggest that American Muslims are negotiating between pessimism and optimism when considering the prospect of a shared future with American Evangelicals and political conservatives. Americans of Muslim and Evangelical faith are not monolithic and each community has its fair share of bad actors. Still, the 150-plus participants conveyed seeds of a willingness to seek forward progress if Evangelicals are willing to share the load. To that end, it is imperative that Evangelicals and Muslims realize this opportunity, to show good neighborliness through a posture of hospitality and love, and to invest their time and generosity in those who seek friendship. Listen to the recording of the panel here. Feature image courtesy of author. From left: Anwar Khan, Bob Roberts, Dalia Mogahed, Kevin Singer and Chris Stackaruk. Kevin Singer and Chris Stackaruk are co-directors of Neighborly Faith, an initiative that seeks to help Evangelicals become better neighbors to people of other faiths. 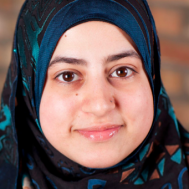 Usra Ghazi is director of policy and programs at America Indivisible and senior fellow at the Freedom Forum Institute’s Religious Freedom Center.